There aren't very many times that the New York Times can convince itself to spread its palate beyond Manhattan and a few key neighborhoods in Brooklyn. So when they take it upon themselves to write a glowing review of a spot on the edge of Middle Village, a place that I almost can walk to (admittedly it's a long walk), then it behooves me to go and see for myself. Cutting through the borough from the Queens Center Mall south towards JFK, Woodhaven Boulevard is far from the sexiest of streets. It's about ten lanes wide, has no cute, tree-lined center island, is less bike friendly than the Belt Parkway, and is almost always packed with traffic. But what it does have is variety. Queens, the most diverse, if not the coolest of boroughs, is well represented by the Boulevard. 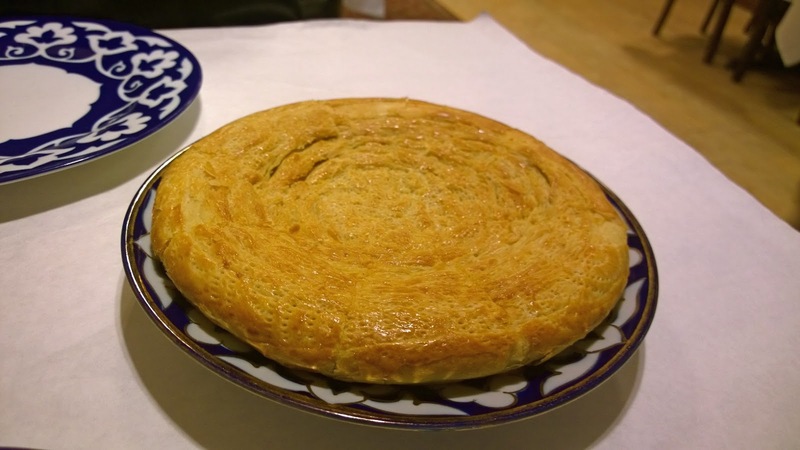 Taste of Samarkand is Uzbek. Down the block, a bar flies an Irish Flag. 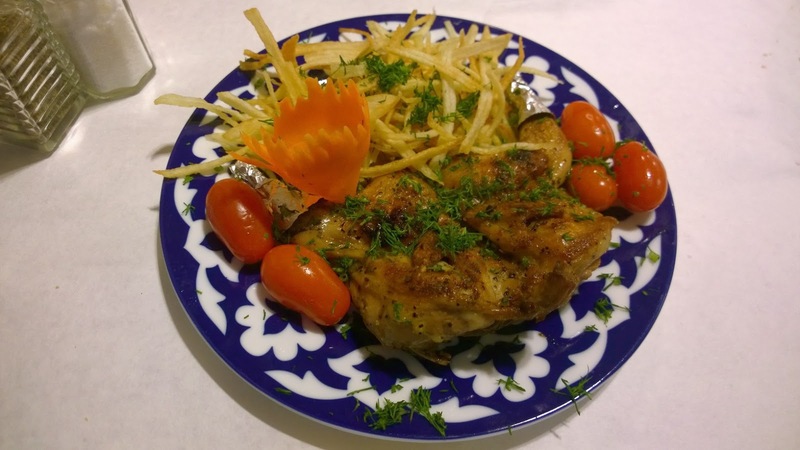 Pio Pio, the insanely good Peruvian restaurant group, started here on Woodhaven. Keep going and there's the seafood place London Lennie's, a Colombian bakery, an Indian restaurant, and the cigar lounge Havana Dreams. But I'm getting distracted. Taste of Samarkand, despite what the menu might allege, is not Mediterranean. 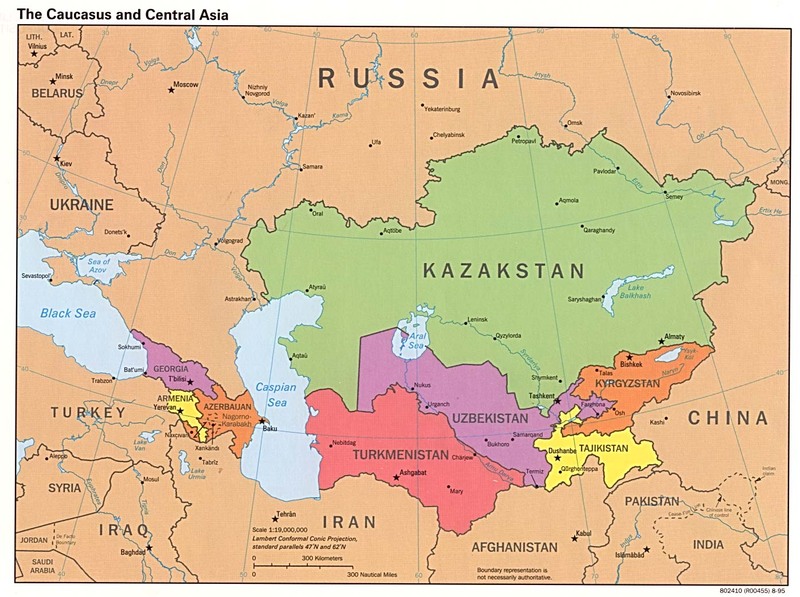 For those who don't know, Uzbekistan is here, all but landlocked in the middle of Central Asia. 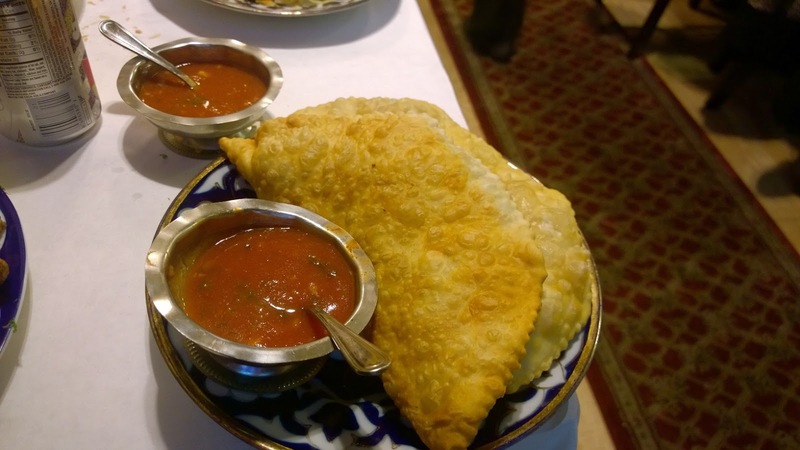 What is Uzbek food like? Well, if this menu was any indication, it's mostly meat and starch. Pastries filled with meat, meat on sticks (kabobs, as it were), meat not on sticks, bread, rice... It's a cuisine designed by Darwin to stave off starvation in the lean months and freezing to death in the cold ones. When I arrived with Seth midweek around 7pm, it was relatively empty. A couple of televisions played a foreign dance program; the lights were bright; the music was so low as to be all but inaudible. Our waitress, dressed in a traditional brightly colored outfit with a beaming but shy smile, led us to a table and took our order. Eventually, people started filing in. Soon, the tables were full and it got surprisingly loud. Families with strollers, groups of guys ordering plates of kabobs. A table with a handful of elderly folks pulled out a bottle of Ketel One from a bag. Ah, Taste of Samarkand is BYOB. We did not know that and tried a central Asian pear soda. My second drink was a Diet Coke. The first thing that we ordered was a bread. This bread was an off-menu special and I don't think I can recommend it. The size of a Frisbee, it's not small but it is dense and tough and bland. Had it been cut into strips and served with a soup, I'd understand getting it. Our waitress explained that its supposed to be torn at by hand, eaten piecemeal, eventually succumbing to death by a thousand cuts. This was not the highlight of the meal. 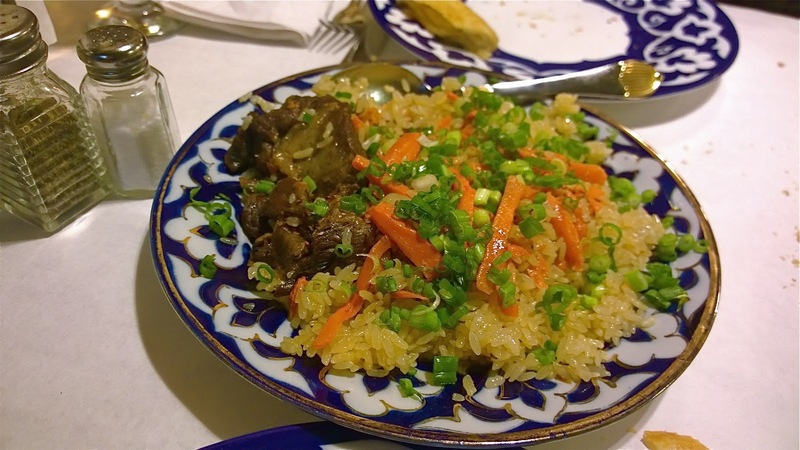 The appetizer I wanted was the Hasib, "beef intestine stuffed with ground beef, rice, and savory spices and flavors". Had Taste of Samarkand simply called it a beef and rice sausage, Seth might have been interested, but they didn't and so he wasn't. Alas, for me, they were fresh out. 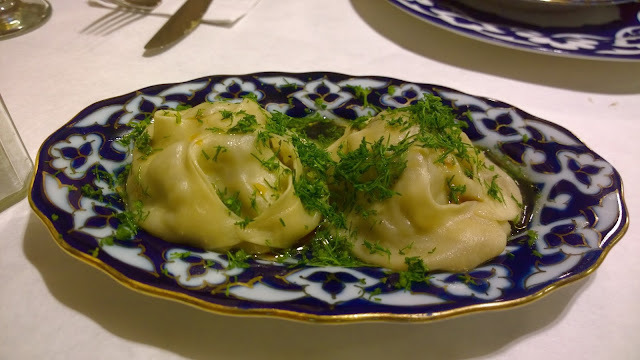 Instead, we ordered three other appetizers, the Samsa, the Uzbek Manti, and the Meat Cheburek. All three are pastries sold individually. The samsa and the manti use the same filling ("meat" that I assume is beef, onion, spice) but where the samsa is in a crispy fried dough, the manti is in a steamed dumpling. Seth preferred the samsa, which was akin to an empanada and very good. The filling was indeed quite flavorful and I challenge any of you out there to be disappointed, but my pick was the manti. I felt that the steamed dumpling and it's dusting of dill had a bit more oomph. 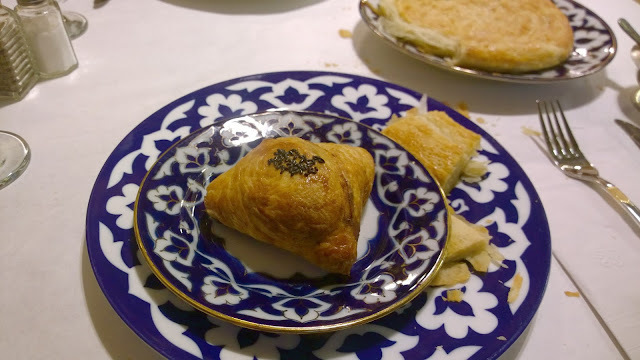 Our third appetizer, the cheburek, took up half the plate and had a slightly different meat filling. Make no mistake, this is a huge pastry but, like a pillowcase holding a bean bag, it's mostly empty. Seventy five percent of it is dough and the meat takes up just a portion of the bottom. The thing is, in the cooking process, the meat steams and the inside fills with a broth. When you bite in, the broth pours out onto the plate. It's a light but filling, very aromatic start to the meal. Kebabs are popular at Taste of Samarkand. At some tables it was all that they ordered. For some reason we were going to skip them, though I don't know why. But then I saw Quail Kabab on the menu and there was no hesitation. It wasn't really a kebab though. It was just a flame-grilled quail with shoestring fries. Seth had a bite and moved on. Quail is a lot of work, but I liked it. Given its small size, you're fighting through a maze of bones all the time, never really getting a lot of meat. Still, I liked the charring and the spices and was glad to be able to try something that most other restaurants don't bother to offer. For our entrees, we ordered an Uzbek Pilaf, a rice dish cooked in lamb fat with scallions, carrots, and lamb, and the Chicken Tabaka, a butterflied pan fried cornish hen "with an Uzbek twist". The pilaf was quite good. It was rich and heavy, but not in the way that made you feel as though you'd eaten a brick. Making the rice with lamb fat infused each grain with flavor. Odds are, you could eat this every day and never get sick of it. The chicken tabaka, on the other hand, was less impressive. 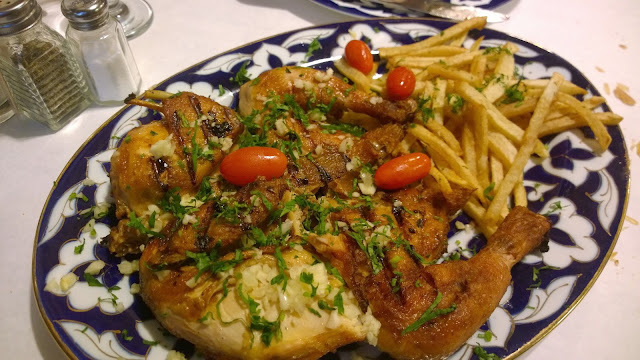 I don't have any idea what "an Uzbek twist" is because it was basically just a standard cornish hen. The spices didn't particularly stand out, the meat was too dry, and the addition of fries was just too much. Seth enjoyed it more than I did and even he gave it a mediocre rating. 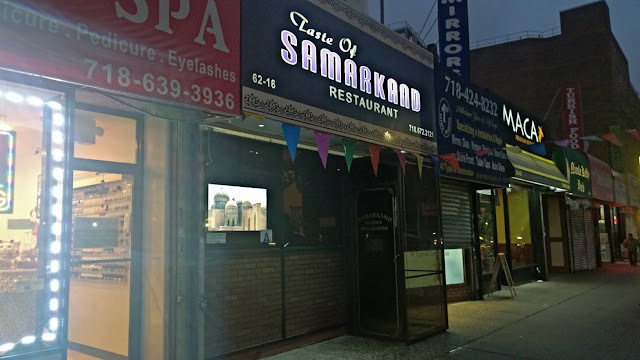 On the whole, Taste of Samarkand is a good place to go and check out, though I can't really fully agree with the New York Times' gushing opinion. There was too much hit or miss and very little in the way of inspiration. Perhaps that's a function of being "traditional"; the food is less about the chef than about the recipe. 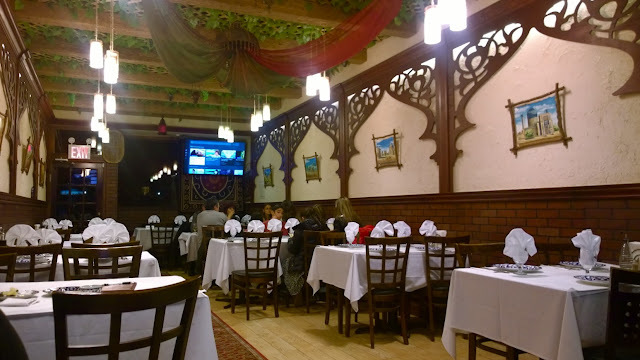 Clearly, the restaurant has a following and attracts a lot of people whose family trace their roots back to the Uzbek region, and this is their comfort food. I would go back and get the appetizers again while loading up on some other kebabs. But I'd skip the bread and bring a bottle of vodka. One can't complain about the cost. Our entire meal including tax and tip came to $60.